OUR POPULAR ON-LOCATION EMF CONSULTANT CERTIFICATION SEMINAR is an accelerated, immersion type of training consisting of a 3+ Day program, during a single week at select locations. Contracted Corporate Seminars are available primarily to EMF Industry related corporations, professional groups, EMF-related companies etc.. They are organized by the company and usually held on-site at the company’s location, or at a nearby convention/seminar facility. Three days 6-7 hours per day (18 - 20 contact hours) with EMF Consultant certification seminar workshop activities, an additional self-guided component, and final exam during a single training event, held at various locations worldwide by contract arrangement. The Seminar training covers the same material as the live virtual classroom training but has the increased ability to include much more field work with trips to on-site and off-site EMF situations that have been remediated by our Certified EMF Expert graduates, in order to demonstrate real-life working examples of EMF Consultants in action. While online Certification training is also available, in-person seminars are by nature more able to focus on actual hands-on demonstrations, with before and after case studies, as well as offering first-hand experiences of new untouched EMF environments for professional EMF analyses as a graduate test requirement. In some cases these company seminars are open for registration to the general public, so If hands-on learning is your best learning style, this 3- 4 day hands-on training immersion format is for you. Often members of a closely related industry may be welcomed (for example realtors, home builders, construction companies, home inspectors etc). Refer to "Seminar Locations and Dates" below to learn more. The Typical EMF Consultant Certification Seminar begins with a pre-course orientation dinner for all seminar participants on the evening before the first training day begins - since this dinner is optional that is why we say 3 - 4 days. Following the first day orientation the next three days training will be 6-7 hours of fast paced training per day, totaling 20 contact hours, with periodic class breaks, and a casual bag-lunch break to enable peer networking time. The training will be completed with a final exam, which will be also offered online unlimited if necessary to improve your grade. Successful passing of the final exam results in certification as an EMF Expert and listing in EMF Experts Directory and all the professional privileges of certification. Training Prices and Discounts are set by the company holding the event. Typically these events are offered at EMF Experts training prices (refer to our Training Info Package for current EMF Consultant Certification Seminar prices), and a half-price Subsequent Registrants is available at the time of online registration. For example, when the primary registrant enrolls in an EMF Consultant certification seminar at full price, he is then able to sponsor up to three additional registrants at half price. This half-price discount is designed to enable companies to train their employees efficiently and economically at one time, and for individuals who plan to include their spouse or family member in their new EMF Consultant business from the outset. Course participants will be required to purchase his/her own EMF equipment, complete field assignments. Prior to the seminar students will prepare for upcoming training sessions by reading a number of related documents, course-specific book chapters, and documentary streaming videos. There will be a certification exam upon completion of the training, which can be taken over until a 100% grade is achieved. Individual classes also have occasional open-book quizzes to keep you on track and give you a leg up on the final (closed book) certification exam. Attaining this Certification actually means something –it demonstrates your credibility to the world by the fact that you have achieved EMF Expert professional competence at an exceptionally high level of excellence. This has led to its being so highly respected in the industry and trusted by customers. Your EMF CONSULTANT CERTIFICATION SEMINAR accommodation options, transportation and area sight-seeing info will be emailed to you directly from the event organizer, with the venue details of that training location, prior to the event. Occasionally Corporate Seminars are open to the general public. When we do an on-site corporate training we offer this option for companies in order to help offset their event costs and costs of training their staff. If you are interested in attending a live on-location 2-4 day seminar, bounce us an email to inquire. Autumn/Winter/Spring Seminars are typically held in the southwest USA (CA, AZ, NV, NM) where the consistent blue-sky weather just cannot be beat. Summer Seminars are held in WA, OR, ID , and various popular cities (or specifically requested areas) in the northeast or central USA. By special arrangement we provide EMF Expert Certification Training Seminars in Canada, Europe, Australia, and many other English speaking countries. Please note we do not promote contracted private company training events in our Training Events Calendar unless the EMF Consultant certification seminar or event is open to the general public. Please contact us if you are interested in organizing a seminar for your group. 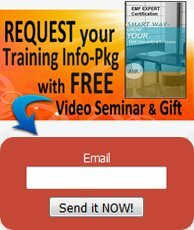 Graduation ceremonies are conducted online at the conclusion of the seminar, with certification diplomas awarded both online (for your website) and mailed to you (for your office). A widely recognized Certified EMF Expert ID card will be mailed to you along with your EMF Expert Certification Diploma. Certified EMF Expert Graduate privileges includes authorized use of the Certified EMF Experts logo and other branding for your marketing use, as well as a special EMF Experts Directory listing with the Certified EMF Experts designation. This directory listing will be kept in place as long as an annual continuing education class is completed to keep you current with EMF industry changes. Your directory listing will be kept that will be well visited by potential customers in your local area searching for an on-site consultation, and in fact potential customers from all over the world requiring a phone consultation with someone of your related background, and listing traffic statistics will be provided to you periodically. You will also receive professionally designed templates to inexpensively create Certified EMF Experts brochures, marketing fliers, window decals or magnetic signs, which can be printed from your computer onto readily available office supply products. Additional Certified EMF Expert Graduate support products will also be available only to graduates for purchase at a nominal cost. You will be able to order such items as a distinctive shirt badge, lapel pin, or ball cap bearing the Certified EMF Expert designation. 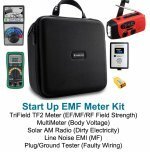 EMF Expert business support material will also be available for purchase, and includes such items as an Certified EMF Expert window decal or magnetic sign for displaying on your vehicle. Additionally, all professional EMF Consultant equipment that we have procured at cost, such as recommended meters, or personal EMF protection products that we offer for sale to the public will be made available to our certified graduates at the wholesale price.